The social networks of the world aren't doing much to make the world a better place. Facilitating communications across borders is great -- a definite net gain for the world's citizens. But these platforms insist on distributing globally while thinking locally, making their operations subject to censorial governments in the countries where they do business. Facebook's refusal to stand up to various authoritarian governments arguably made it an accessory to the fact in genocide. Twitter tends to sit back and let Turkey's government vanish away criticism of President Erdogan and his actions. Google appears to be one of the few companies responsive to the Chinese government's demands for content deletion, which is probably due to its ability to get past the country's Great Firewall as well as its temporarily suspended construction of a Chinese government-controlled search engine. One social network rarely appears in these discussions, most likely because few people actually see it as a social network. LinkedIn -- the de facto adult in the world of social networking -- is also giving China what it wants when it wants it. LinkedIn is one of the only American social media services to be warmly welcomed on the other side of the Great Firewall. 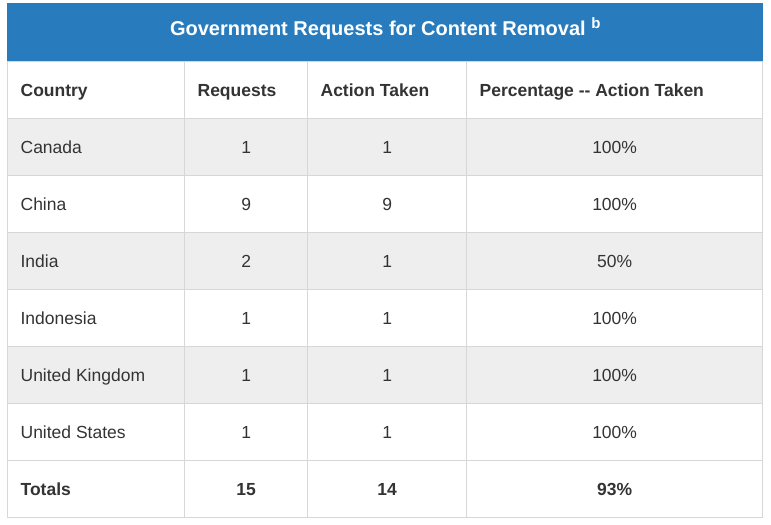 Consequently, this means it actually has something to report about China and its demands for content removal in its transparency reports. So far, the censorship plan is working... with an assist from LinkedIn. While we strongly support freedom of expression, we recognized when we launched that we would need to adhere to the requirements of the Chinese government in order to operate in China. Then, when the heat comes down, LinkedIn is trying to pretend its proxy censorship was just a mistake. Asked why Humphrey's profile had been removed in China, Nicole Leverich, a spokesperson for LinkedIn, said an internal review found the profile was “blocked in error.” It has now been restored for users in China, she said. “Our Trust and Safety team is updating our internal processes to help prevent an error like this from happening again,” she added. Swell, if that is what's actually going to happen going forward. But China is batting 9-for-9 in takedowns so far, which seems to indicate the review process kicks in only after people start complaining, rather than when LinkedIn receives requests from the Chinese government. While it makes things easier to abide by local laws when offering services in other countries, companies shouldn't be in any hurry to indulge censorship just because locals laws enable the silencing of criticism and dissent.